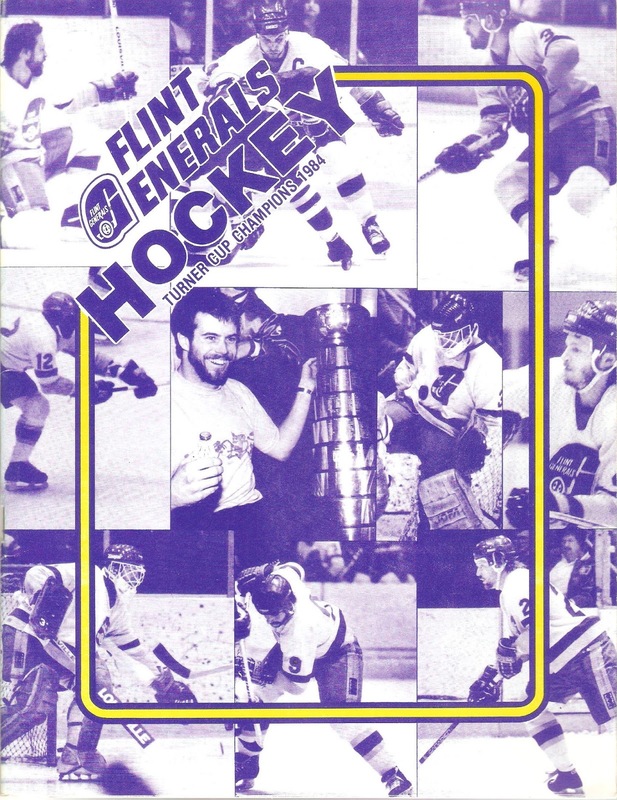 The Flint Generals were in their sixteenth year of existence in 1984-85. The franchise was coming off it's finest hour in the previous year, winning their first-ever Turner Cup championship. The Generals swept aside both Milwaukee and Toledo in four straight, the first team to sweep to the Cup since the 1969 Dayton Gems. Dr. Eugene Chardoul led the consortium that had owned the Generals for the past several years. Former Saginaw Gears and Generals forward Dennis Desrosiers returned for his second season as head coach and general manager. The team played their home games at the 4,021-seat IMA Sports Arena. Desrosiers' Generals had a fine season in 1984-85, going 43-32-4. Their 93 points placed them in second place in the IHL Eastern Division, ten points behind league-best Muskegon. Flint had the third-most goals scored that season, with 349. Gilles Thibaudeau, a rookie from the Montreal system, led the team in scoring with 52 goals and 97 points. Four other players had at least 35 goals that year, including future (Colonial League) Generals coach Peter Horachek, who had 38. Defense seemed to be a bit of a weak spot in the Vehicle City, as the Gens surrendered 340 goals, third-worst in the league. Rick Knickle and Rick Wilson were the two main netminders in Flint, though the Gens used six throughout the season. Knickle was in net for the postseason. The Generals opened the Turner Cup Playoffs against a tough opponent, the third-place Kalamazoo Wings. The K-Wings were just four points behind the Gens and allowed about 50 fewer goals. In a back-and-forth series, the Generals fell in Game 7 on IMA ice, 4-3 in overtime. Kalamazoo would be swept aside by Muskegon in the second round, and Peoria would claim the Turner Cup. The Generals always had nice-looking programs, and this one is no different. It's 58 pages, black-and-white, and loaded with the usual advertisements. This program is from Game 3 of the series, which the Generals won, 2-1. There's a recap of the 1983-84 playoff run. Nice to see they drew big crowds for their two Finals games. Former Gears forward Dave Westner was not only the broadcast booth, but was also an assistant coach. Len Hoyes offered an article about the Generals' luck in playoff overtime games. A directory of the IHL is included as well. Local advertisements include WCRZ Cars 108 FM, WHNN 96 FM ("Alive and Lite"), Stroh's Beer and James Lumber. The Windmill Place shopping center, one of Flint's attempts to diversify after the auto industry tanked, also had a small ad. Car advertisements included the Buick Somerset and the Chevrolet Celebrity Eurosport. 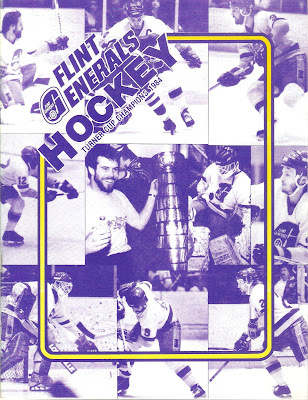 Aftermath: 1984-85 would be the last hurrah for the Flint Generals. Ownership spent the majority of the summer battling with the City of Flint over lease agreement for the IMA. When talks stalled, the Generals moved up I-75 to Saginaw for the 1985-86 season. The Generals would be replaced by the expansion Flint Spirits.